What Nation Is Second When the Big Outsourcers Are Hiring H-1Bs? One way of looking at the flagrant pro-Indian bias among the big outsourcing companies is to calculate the ratio of Indians hired through the H-1 program to nationals from the second nation favored by specific employers. 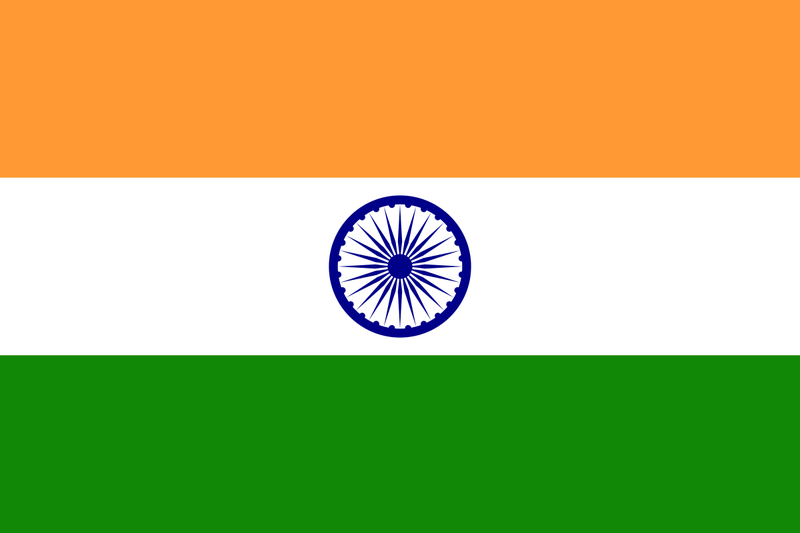 So Employer A, based in India, really, really likes Indians, but has a second choice nation, too. Do you suppose that the employer is hiring, say, 20 times as many Indians as, say, Chinese? Or maybe the comparison is even higher, say 40 to one? 100 to one? Well, no. These are ridiculous under-estimates of the extent of the bias. Using 2,000 as our base in place of the usual 100 percent, Tata Consultancy, for example, is on record for the fiscal years 2005-2012 as hiring 1,994 Indian H-1B workers; coming in second was the United Arab Emirates, with (statistically) less than one hire. Wipro was a little less biased, but not much; its ratio was 1,992 Indians to less than one person from China. If the hiring ratio is, as with Tata, 99.7 percent Indian, and in the second-most-popular nation the percentage is 0.0 percent, then we see the 1,994 is to be contrasted with the less than one, because 0.1 percent represents one out of 1,000. Tata must have hired at least one person from UAE, but not so many as to reach the one out of 2,000 ratio, which would have produced 0.05 percent, which would have been rounded to 0.1 percent. 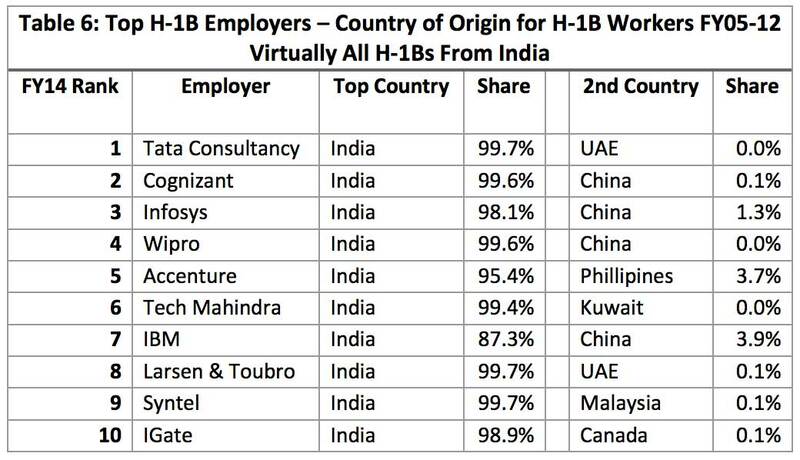 So Tata has a more than 2,000 to one preference for Indians over Emiratis when it comes to H-1B hires, and an even stronger preference for Indians over people from all other nations on the globe, such as from China, which has about 150 times as many people as the UAE. And an employer hiring an H-1B, from anywhere in the world, is, by definition, not hiring a resident of America. My thoughts on this were stimulated by this table, which is from the testimony of Howard University professor Ron Hira before the U.S. Senate immigration subcommittee on February 25, 2016. The only employer on Hira's list to dip below the 95 percent Indian mark is IBM; it reported that only 87.3 percent of its H-1Bs over a period of seven years were from India. The second most popular country on the list, but never with more than 3.9 percent of the hires, is China. It appears four times. UAE appears twice. The other second choices were Canada, Kuwait, Malaysia, and the Philippines. One wonders if those few H-1B hires from Kuwait and UAE may have been — at least in part — favors granted by the outsourcers to relatives of its Middle East customers. Here's the data from Hira's table regarding the 10 largest H-1B users converted from the usual 100-percent base to a 2,000-worker base. Source: Table 6 from Hira's testimony. To secure the number of H-1B workers from other nations per 2,000 for a given employer, sum the India share (1,992 in the case of Cognizant), and the second country share (two), and subtract that from 2,000, getting six for Cognizant. My sense is that it is useful to present the pro-Indian bias in the H-1B program as dramatically as possible. Maybe there should be a sixth column in the table above; it would be headed "USA" and it would have a series of zeroes from top to bottom.